After watching the Craft Magazine video on how to wrap gifts with fabric I was inspired! 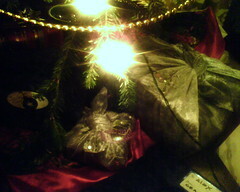 I bought on-sale holiday fabrics (silver snowflake and blue crushed velvet fabric) and wrapped most of our gifts with it. The added bonus is that Alex can then use the fabric to sew pillows and quilts!